Glass's encounter with a grizzly has become part of frontiersmen legend, embellished in magazines, novels and even sculpture - and movies. Alejandro G. Inarritu's movie The Revenant  is based on a famous episode in the life of Hugh Glass, an early 19th Century American frontiersman whose exploits - many of which have been considerably embellished - have become legendary. Aspects of Glass's life had previously been filmed in the early 1970s as Man in the Wilderness, with Richard harris as Zachary Bass, a character based onGlass. Inarritu has focused on the most celebrated but dubiously authenticated episodes in the frontiersman's dangerous life. In 1823 Glass was a member of a fur-trapping expedition in a wild area near the Grand River on what is now the North-South Dakota border. He was sent to hunt meat when he was attacked by a female grizzly bear, possibly protecting her cubs.Repeatedly raked by her claws, he was saved by his hunting companions. But his wounds [broken leg,severe wounds to his chest, back and neck], were so bad that his companions believed he would soon die. As the party was intruding in an area the local Anakira Indians believed was their hunting grounds, the group's leader, Andrew Henry, decided it was safest not to stay. He left two volunteers -John Fitzpatrick and a youth, Jim Bridger - to stay with Glass until he died, and then catch up with the rest of the hunting group. What happened next is uncertain, but it seems that the pair dug a grave believing that Glass would soon die, but he stubbornly hung on to life. 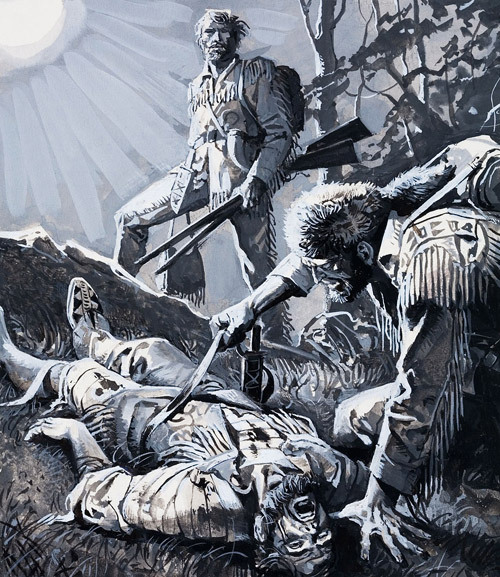 After a few days Bridger and Fitzpatrick put Glass in the grave, covered him with a bearskin, took his rifle, hunting knife and other possessions and went to rejoin the rest of their party. They told them Glass had died. Glass then entered the realms of western legend. He reset his leg and then crawled for two months to the Cheyenne River, 100 miles distant. Here he built a raft, was helped by Indians and eventually reached Fort Kiowa, which was Andrew Henry's outpost. What happened next is uncertain. He seems to have forgiven Bridges (on account of his youth?) and then set out after Fitzpatrick. After recuperating he set out on a mission of revenge against the two companions who had left him for dead. This purports to be a pictire of Hugh Glass. 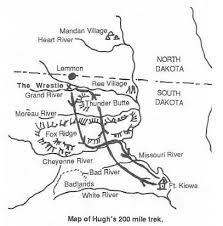 Hugh Glass's life has few verifiable milestones. He was born of Scots-Rish parents, probably about 1870 and probably in Pennsylvania. He may -or may not - have been captured and escaped from pirates off the Texas coast and he may have married a Pawnee woman after his possible capture by Pawnees. 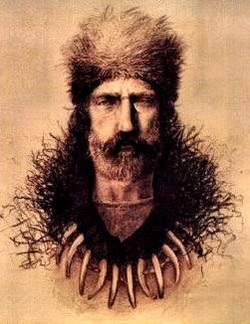 What is definitely known is that in 1822 he took a job in a "corps" of about a hundred men employed by William Ashley as a fur-trapping expedition into the wild upper Missouri area [modern Montana and North and South Dakota].Many of his companions also eventually gained legendary reputations as mountain-men / frontiersmen e.g. Jedebiah Smith and Jim Bridger. 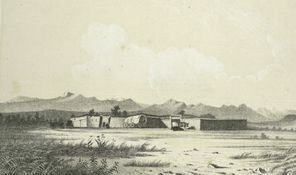 In May 1823 the exppedition was attacked by Arikira warriors and Glass may have been wounded. In August he was sent to hunt for food near Grand River, where he was attacked by the famous grizzly, which was possibly defending its cubs. The episode was later, ironically, referred to as the "wrestle". After his legendary epic journey and his mission to seek revenge on Bridger and Fitzpatrick, Glass resumed his hazardous if undocumented life as a hunter and trapper. But in 1833 he and two fellow trappers were ambushed and killed by Arikira warriors. 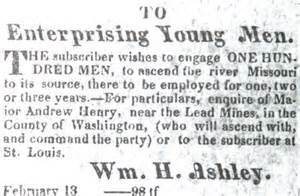 The advertisement that recruited Glass, Bridger and Fitzpatrick and nearly one hundred others. Illustration of Glass about to be abandoned. We will never know the true facts about Glass's epic journey to safety. What is certain is that suffering terrible injuries,unable to walk and without guns or knives or a map, Glass spent months traversing hundreds of miles of dangerous wilderness, with a scarred, maggot-infested back. At first he could only only move by crawling along the ground. Glass seems to have survived by killing and eating a rattlesnake, chewing berries and birds' eggs,and devouring the remains of a buffalo carcass. It seems likely that a group of friendly Sioux Indians rescued him - possibly fairly early on in his journey - cleansed his wounds, ( perhaps using their method of sewing a buffalo hide patch onto his back), fed him and took him to Fort Kiowa and safety. In the movie, the Glass character plots revenge against those who deserted him. But the real story was not quite so dramatic. Jim Bridger, a target of Glass's revenge. Jim Bridger and John Fitzpatrick, the two men who abandoned Glass to die in the wilderness, were both frontiersman themselves. Fitzpatrick, like Glass, left behind no authentic image and few if any details about his life, although we know he joined the army in 1824 on his flight from a vengeful Glass. Glass, realising Fitzpatrick was now under protection of the Army, let Fitzpatrick live. Bridger, like Glass, became an iconic frotiersman figure. Born in 1804, an innkeeper's son, in 1822 he headed west and joined the hundred men of William Ashley's trapping expedition, which included Glass. Although the latter vowed vengeance on Bridger, he eventually abandoned his mission of retribution, possibly because of Bridger's youth. Bridger married twice, to Indian women. His eventful life ended, apparently peacefully, in 1881. He was one of the few trappers to survive the end of the trapping era in the West.